This black solar lamp post light stands 2.1 meters tall, and is a superb option for providing elegant driveway and outdoor garden lighting for your home. 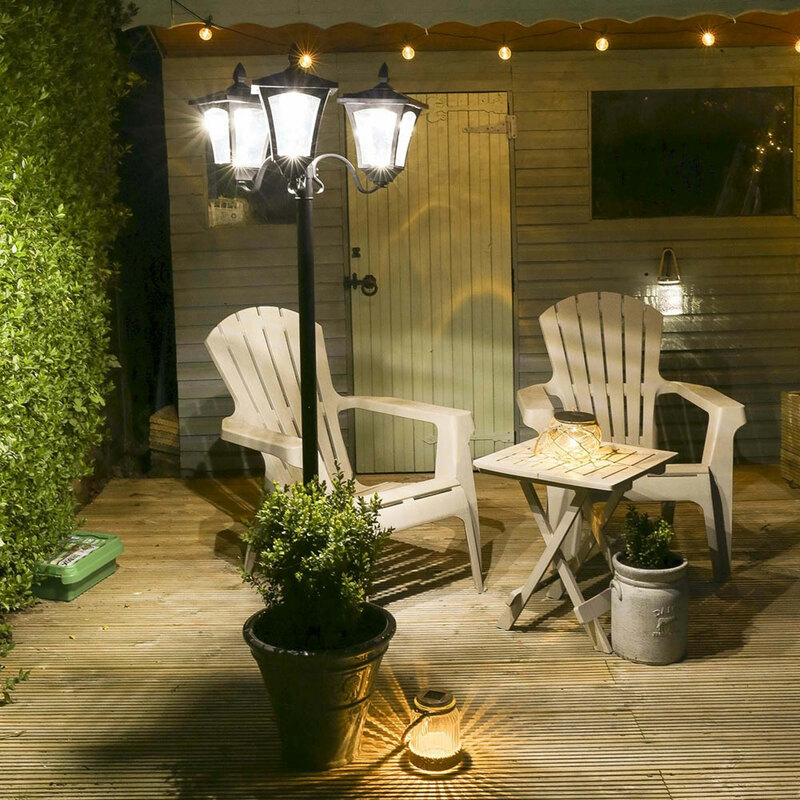 It features 18 LED bulbs, in either white or warm white, and has fantastic durability in all weather conditions, due to it being manufactured to a high standard from aluminium and polypropylene. The lamp offers dual brightness settings; the high brightness setting is better for the summer months, when fewer hours of darkness allow the light to operate at full brightness without using the battery's charge. The low brightness setting is better suited to the winter months, when more hours of darkness mean your light will need to operate for longer; the low setting sets the LEDs to emit a reduced brightness, thus conserving the battery's charge as it works throughout the longer winter nights. It operates on a static ON setting, which intelligently switches itself on as daylight fades and there is also an Off switch. This product can be assembled in minutes and is very versatile, with various display and fixing options. The floor fitting is used to attach the light to hard surfaces like wood, stone and concrete. The spike fitting is for softer ground such as soil in borders, lawns and pots. There are two poles included, so you can either choose to have the light at 2.1 m maximum or smaller if you wish. These lamp posts can be assembled in minutes and are very versatile, with many display and fixing options. The floor fittings are used to attach the lights to hard surfaces like wood, stone and concrete. The spike fittings are for softer ground such as soil in borders, lawns and pots. These Solar Lamp Posts are fully automatic so you don't need to turn them on and off each night.